The new Bluebird card from American Express is the new killer app of debit cards. It has the potential to be a complete game changer in the points earning game. Bluebird through its Pay Bills Option makes it possible to rack up tens of thousands of points per month when you pay items like mortgages, school loans, and car payments. In the past you have not been able to earn points on transactions like these. Bluebird allows you to pay up to $10,000 per month in bills. You can withdraw cash from ATM’s and pay just about anyone. According to American Express, "Bluebird addresses the need for an affordable, transparent way to manage everyday finances, with premium features, no minimum balance, monthly, or overdraft fees". First of all, you need to order a Bluebird card or pick one up at Walmart. They are available for order directly online through American Express. The best way to add funds to your Bluebird account is with a Vanilla Reload card that you can purchase at places like Walgreens, CVS or other locations. To load the account, you would simply log onto the Bluebird account you created when you purchased or registered the card, and then enter the numbers on the back of the Vanilla Reload card. It’s that easy! As a Dentist, I have a lot of items I could "purchase" at pharmacies without my activity looking suspicious. As an example of how this works, I could use my American Express Hilton Surpass card that earns 6X Hilton points per dollar spent at pharmacies and supermarkets, to purchase $500 Vanilla reload cards in multiple of 5 at a time. Each Vanilla Reload card costs $3.95 in addition to the money you are loading onto the card. For every $500 card I buy, I will then receive 3000 Hilton points (6X points x $500). Essentially I am buying 3000 Hilton points for $3.95. If I buy 5 cards at a time, I am earning 15,000 Hilton points on each visit to CVS. That would be more than enough for a 1 night stay at a category 2 Hilton which requires 12,500 points. For less than $20 I have purchased a 1 night stay. Not bad, but let’s kick it up a notch. Now let's use the power of Dental Office Spending. If I stop at CVS once a week, (some of you probably stop at Starbucks once a day) then I am earning 60,000 Hilton points in a month. At that rate, I am earning 180,000 Hilton points every quarter. (Remember Bluebird's maximum monthly bill pay is $10,000/mo). That is enough points to claim a VIP award good for a 6 night stay at a Category 6 Hilton. Not bad for $240 and 12 trips to CVS. At that rate, I could earn a six night Hilton stay every three months just for paying bills through my Bluebird account. Now I probably wouldn't use my card exactly this way as spending $10,000/month on my Hilton card would probably raise more than a few red flags. I would probably spread out my monthly purchases over 3 or 4 different credit cards from different banks so that I don't have my accounts shut down. I love Flexible points, so I might use my Chase Ink Bold Card or my Starwood Preferred Business Amex card for some of those Vanilla card purchases. Now, what do I do with $10,000/month in my Bluebird account? I can use it to pay my mortgage, car payments, or school tuition for my son. I could pay my off my credit card bills. I could use it to pay any bill that I can’t typically pay and earn points. I could also pay office bills like supplies and lab bills which don't earn bonus points. The list is almost endless. With Bluebird, you now have the ability to generate tens of thousands of points that were not possible to earn before. It truly is a killer app. Feel free to leave a comment about you will use your new Bluebird card. Disclaimer: I have no affiliation with Chase bank or any of its products. I do receive a small referral fee from Amex if you sign up for one of their cards using one of my links. I need to send that link directly to you. 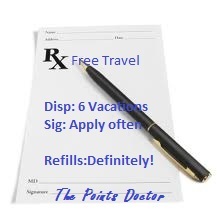 Please email me at the pointsdoctor@comcast.net. I appreciate it greatly when you use one of my links! So why would this raise a red flag if you go to the $10,000 a month limit? I'm thinking this would be a good way for me to rack up points on my personal (not business) side since I have large recurring payments every month (mortgage, vacation home mortgage, disability ins premiums....) can you explain? The credit card company might flag you for points abuse and shut down your account You risk forfeiture of your points. I would open up a couple more personal accounts like Chase Sapphire or Starwood Preferred in addition to whatever cards you have unless you have a specific travel earnings goal in mind.